This easy fish chowder recipe is a pretty healthy recipe. It just uses a bit of butter for flavor and adds healthy ingredients like garlic, onions, tomatoes and herbs. Make sure the fish is boned and small bones are removed as much as possible. Cut into even-sized pieces. Melt the butter and sweat the onions, crushed garlic, and diced potato for about 5 minutes. Add the canned tomatoes with the herbs and seasoning. Add the hot water. Bring it all to a boil and then lower the heat and simmer for about 20 minutes, or until potatoes are cooked. Add the fish for about the last 10 minutes. Taste for seasoning and make sure all the fish is cooked. Add the milk and stir over a low heat for a few minutes. Sprinkle the bowls of chowder with chopped parsley. Serve with French bread or crusty rolls. Haddock chowder is wonderful and this recipe works really well with haddock. Use any boned white fish for this except very thin fish like sole. The sole will virtually disappear into the chowder because it is very thin and will break up as it cooks. I love any recipe where I can include garlic and onions. Both of them are just so healthy for us. And they make anything they are added to just sing with flavor. This is a simple and easy fish recipe that can be ready in less than 1/2 hour. Don’t you just love 30 minute meals? I do. Plus, it is SO wonderfully healthy for us. If you like this recipe, I’d love you to Pin it to Pinterest, Tweet about it and like it on Facebook. Add your own favorite recipes or a comment below. 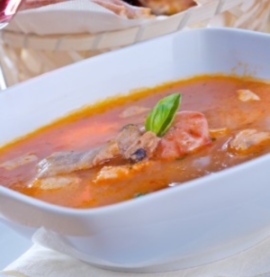 Fish chowder is just one of our savory fish recipes. Find them all here. an old , English style recipe that my family has used for years – but -!!! go easy on the tomatoes – a bit tooo much in this recipe – the chowder needs color , not an overpowering taste of tomatoes – use half the can , freeze the rest for later use . oops !!! do not use a can of tomatoes in herb/ garlic ! !